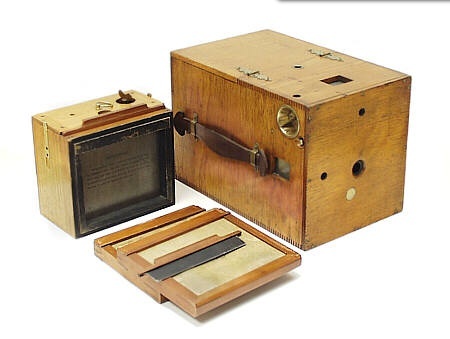 "Now then, look perfectly natural, and remain very quiet for just a moment" the photographer says in a deliberate voice after posing his subject and preparing the tripod mounted polished wood camera with brass lens. In a smooth motion, the bulb is squeezed and both photographer and subject await the final result. It's a scene that has replayed itself since the invention of photography. 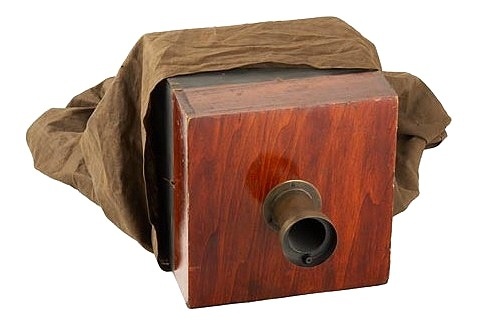 But if the subject is posing in front of an early 20th century photographer using a DeMoulin camera, the outcome is always surprising. Instead of the soft sound of a shutter opening, a strong stream of water suddenly erupts from the lens showering the formerly smiling and now startled subject. Laughter breaks the silence of the once quiet room as the perplexed poser now realizes that he has completed a Lodge or Fraternal Order rite of passage. 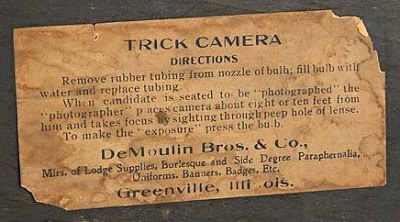 Trick Camera, c.1910-1930 DeMoulin Bros. & Company. Greenville, IL. According to DeMoulin collector and historian John Goldsmith, "the company printed catalogs specific to each organization, as well as catalogs for burlesque and side show operators." 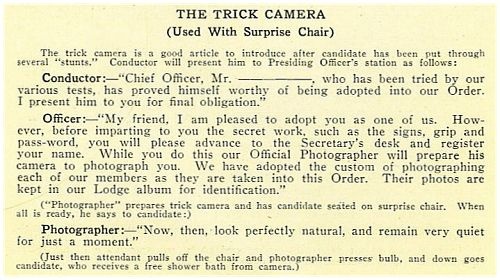 DeMoulin catalogs suggest that the camera be used after a candidate has been through several "stunts" and created a scenario to entice Lodges and Fraternal Orders to buy the camera. "It is perfectly natural for the Lodge to want the candidate's picture to keep on file for identification or for advertising he should show up missing. But if the candidate knows how near he is to his "down-fall," he might have a suspicion that his picture is intended for the rogues' gallery. 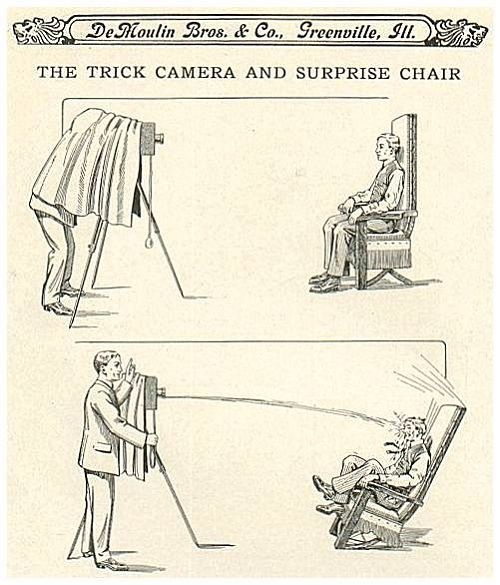 The Trick Camera is a clever device, having the appearance of a real camera. The photographer takes focus through a peep hole in the lens and asks the candidate to sit perfectly quiet, smile, etc. He then presses the bulb, which sends a spray of water with strong force into the candidate's face. At the same time, if the Surprise Chair is used, the attendant pulls it off, causing it to rock backward and fire a blank cartridge." 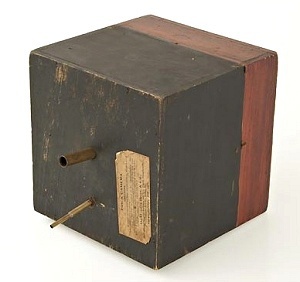 The 8 inch x 8 inch camera with folding tripod and focusing cloth sold for $5.75 and was later advertised as a entire outfit with the addition of 12 comic photos (to complete the illusion) for $16.00. For another $33.50, organizations could also buy the Surprise Chair with 50 cartridges.